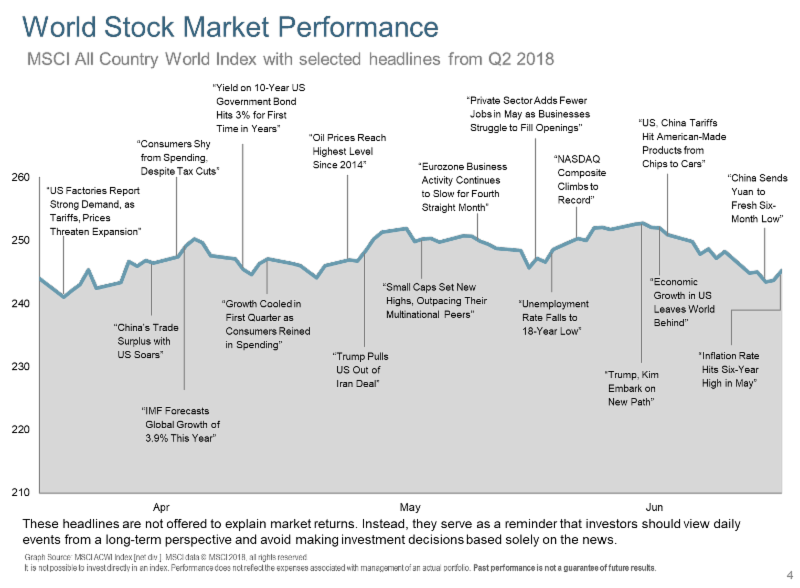 Most market indices finished Q218 higher despite concerns about trade wars, political uncertainty in Europe, and signs of slowing growth worldwide. Global expansion continued but much more unevenly amongst world economies. After underperforming international stocks during most of 2017, U.S. equities took the lead. With a heavier weighting in technology stocks, the Nasdaq Composite Index increased 6.3% and booked its eighth straight gain while small capitalized company stocks with revenues generated domestically also performed well. S&P 500 companies, more reliant on overseas revenues, provided a small but positive return. Jurrien Timmer, Director of Global Macro at Fidelity’s Global Asset Allocation Division, pointed out that global stock markets have performed more or less in lockstep since October 2016. The availability of credit continues to decline in conjunction with interest rate increases and, despite higher than expected U.S. corporate earnings (+25% in Q118 vs Q117), the S&P 500 has been stuck in a trading range of roughly plus or minus 10% for the past 5 months. Current projections are calling for another 20% increase in domestic earnings over for the next 3 quarters while the future price earnings ratio has realigned to a more typical 16.7X earnings. In contrast to the global synchronous growth experienced in 2016-2017, overseas markets were weighed down by a decrease in earnings growth and a strengthening U.S. dollar. Emerging markets were most affected by this, especially developing countries with a higher proportion of debt requiring payment back in dollars. As expected, in June, the Fed raised its benchmark federal-funds rate a quarter percentage point to a range between 1.75% and 2%. 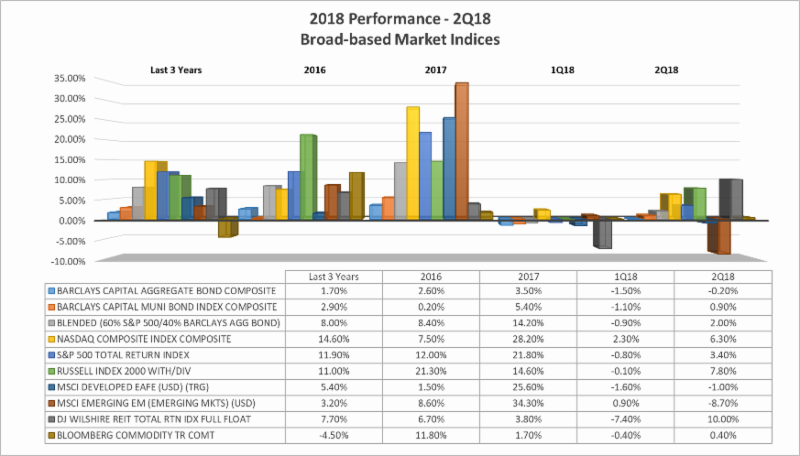 This is the second such increase this year and the 7th time since December 2015 resulting in weak returns across most bond categories. Most Fed officials predict a total of at least four rate increases this year, up from three. U.S. short-term interest rates as represented in the 2-year Treasury (currently at 2.57%), are above the core rate of inflation released in May at 2.2%. This is considered a more normal valuation in a moderate inflationary environment. With continued shrinking of the Fed’s balance sheet for the first time in a decade, Fed policy has moved from neutral to a tightening stage. Other central banks are also ending their easy monetary policies. The European Central Bank is indicating an end to bond purchases at the end of 2018 and a move towards higher interest rates in 2019 while the U.S. bond market has continued to adjust lower in price and higher in yield for short-term maturities. Longer-term bond yields remain stubbornly lower than the Fed’s projections for future rate increases with the 10-year Treasury currently at 2.83%. The spread between short and long-term rates is at a low of .26% from .60%. Experts continue to debate this as a condition related to the Fed’s reversal of near-zero interest rate policies used after the Financial Crisis of 2008-2014, versus a projection of a slowing U.S. and global economy from higher rates. If indeed this is accurately projecting a slowdown, could the Fed “ease” again by raising rates more slowly? This scenario is being discussed by economists and likened to the 2014-2016 cycle when liquidity problems in China and emerging markets caused the Fed to ease off its path towards higher interest rates. Others feel easing is not an option at this point given strong employment growth, increasing inflation indicators and the continued stimulus effects on the economy from tax cuts. Alternative income investments were mixed. Real Estate Investment Trust (REITs), which are less exposed to trade risk, bounced back Q218. Commodities started the quarter strong but weakened when China promised to add tariffs to U.S. imported farm products. Overall, oil continued to rise due to increased global demand and decreased supplies. This is largely due to the U.S. abandoning the Iran Nuclear Deal and reinstituting sanctions affecting Iran’s contribution, Venezuela’s collapsing economy, and Libya’s political turmoil. Despite a positive start, global infrastructure themed investments were affected by trade fears; ending slightly lower. Are we in the late cycle of the economic expansion? Due to the continued projected growth in U.S. earnings, full employment and moderate but increasing inflation, many experts don’t think so, at least not yet. Some predict the beginning of a more mature stage of expansion with the world economy continuing to grow, but at a slower pace. All opinions point to a continuation of volatility as both equity and bond markets anticipate the velocity of future growth, outcome of tariff talks and the probability of a central bank keeping rates at just the right level for continued expansion with moderate inflation. Enjoy your summer months with loved ones and family members. As always feel free to contact us should you like to discuss any of the above.